A probing meditation on the nature, value, and beauty of purity, In Defense of Purity is not a book of sexual ethics, nor a "how-to" guide to purity--but for readers with open minds and hearts, the book promises to be transformative. When Dietrich von Hildebrand converted to Catholicism in 1914, he was surprised to find that, despite an abundance of books on the dangers of impurity, there were practically none on the positive values of purity. 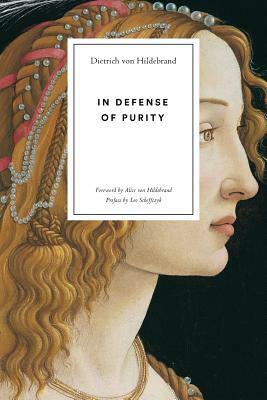 "So," writes Alice von Hildebrand, widow of Dietrich, in a new foreword to the book: "this is what he set out to do in In Defense of Purity: to explore purity as a positive reality and only in light of its beauty to describe its contrary." First published in 1927, In Defense of Purity anticipates many of the most pressing social issues of our day. Hildebrand's vision of the human person offers an antidote to a contemporary attitude that treats the body as a mere object and fails to appreciate its integral unity with the person. In Defense of Purity has influenced thinkers like Karol Wojtyla/Pope John Paul II, whose own Love and Responsibility and Theology of the Body share and build upon many of Dietrich von Hildebrand's insights. This new edition stands to influence a new generation of readers, looking for enduring answers to the perennial questions about human life and love. In Defense of Purity cuts through the current debates to offer a fundamental view of the very essence and meaning of purity. Hildebrand's insights on love, marriage, virginity, and sexuality offer fresh wisdom to people in any stage of life, from first dates, to religious vows, to golden anniversaries.